Egypt, which sent a delegation to Gaza on Tuesday for the latest round of talks on a long-term ceasefire, postponed a visit there by its intelligence chief, Abbas Kamel, following Wednesday's surge in violence, Palestinian officials said. Netanyahu said that in a statement that unless attacks from Gaza ceased, "Israel will act with great force" to stop them. With a nod to the Egyptian talks, Gaza's dominant Hamas Islamists and other major militant groups took the unusual step of denying responsibility for Wednesday's launchings, saying they rejected "all irresponsible attempts to sabotage the Egyptian effort, including the firing of the rockets". Israeli Regional Cooperation Minister Tzachi Hanegbi told Israel Radio there was evidence to back up the Hamas statement. But he said Israeli policy dictated an "immediate and forceful retaliation" against Hamas because the groups controls Gaza. Israel's military said it struck armed training camps in Gaza and also targeted a squad about to launch a rocket. Many people in Gaza awoke to the sounds of explosions. Families crowded into a nearby hospital where the dead man's mother collapsed over his body. Cairo has been holding talks with Hamas on a truce with Israel and ways to end 11 years of division with Palestinian President Mahmoud Abbas's Fatah faction in the occupied West Bank. 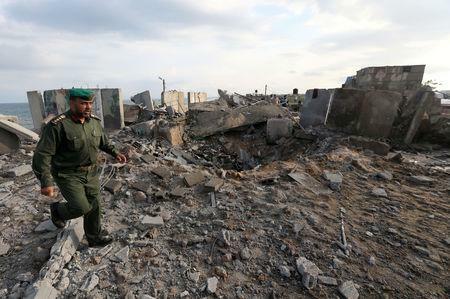 A Palestinian source said Egyptian officials in Gaza have been in touch with Israel to try to avoid further escalation.